A2 –The Crickets (2) Oh Boy! Music performed by the Crickets after Buddy's death. Narration by Red Robinson. 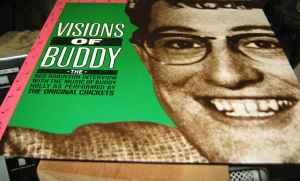 This should be classified under compilations as it is a cash-in marrying a very brief interview with Buddy Holly with new Red Robinson narration and performances taken from the 1970 Crickets' record Rockin' 50's Rock n' Roll. The performances sound as though they may be differently mixed, with the strings sound a little lower in the mix (to my ears). This may be because the first three songs on that album were edited together linked with strings somewhat like Sgt. Pepper, but here appear out of sequence to fit the narration and interview. The song Rockin' 50's Rock n' Roll is absent here, but it's reprise at the end of the medley remains, making the whole affair seem like the cheap cash in that it is. Also, the album sleeve reproduces a photo of the 1961-1964 Crickets line-up and neglects to mention the presence of Eric Clapton on lead guitar for That'll Be the Day.